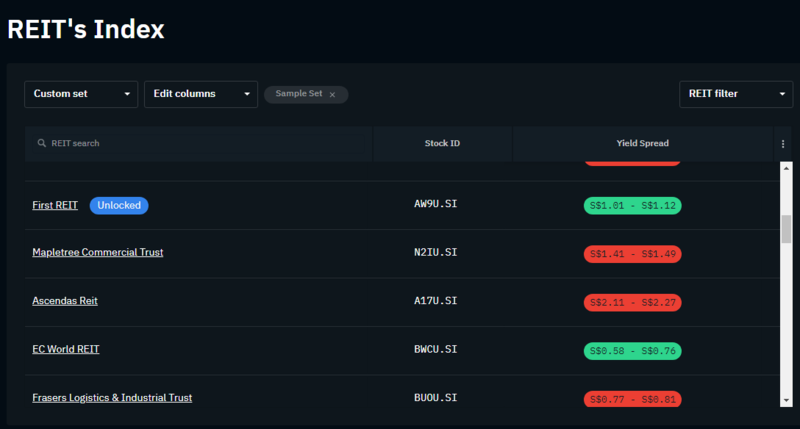 REITScreener’s was designed to make it easier for investors to quickly shortlist high quality REITs based on their historical track record. Using the Quality Score, investors can easily shortlist the highest quality REITs. For more information, see our article about the Quality Score. However it is not enough to simply buy a good quality REIT, we must also buy it at the right price. This is the central investment philosophy of REITScreener, buying high quality REITs at the right price. REITScreener uses 3 different methods to independently derive a fair value. Ranges below the fair value are potential buy opportunities while ranges above the fair value are potential sell opportunities. 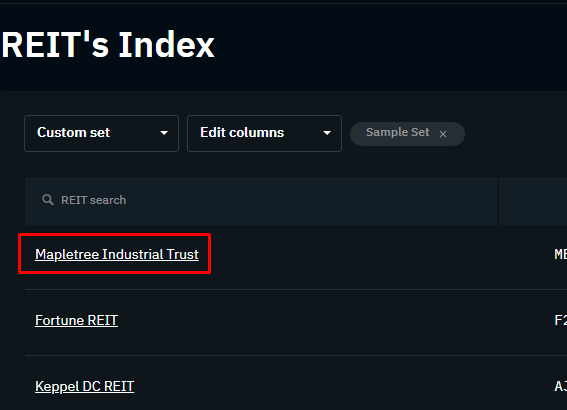 For this example, we are using the Valuation Range of Mapletree Industrial Trust. The first method is known as the Absolute Valuation and this uses a modified dividend discount model to derive the fair value. This method is known as an Absolute Valuation because it does not depend on any form of comparison with trading price or with other comparators. It purely uses historical DPU performance of the REIT. 2. Click on Edit Columns and mark Absolute Valuation checked. REITScreener uses a modified DDM without a terminal value. The modified DDM essentially values the REIT using forecast future DPU and discounting that DPU back to present value over a 15-year period. Discount rates vary depending on the sector of the REIT while the growth rate depends on this historical track record of DPU growth. The second method is of valuation uses the Price-to-Book Ratio or P/B Ratio to estimate the fair value. This method is relative as it depends on the historical trading price of the REIT. Because this method is relative, therefore is must be compared against something. REITScreener compares the P/B Ratio using the historical trading range rather and a simple absolute above or below 1. REITScreeners philosophy is that markets are inefficient and irrational as certain times and tend to overreact either possitively or negatively to news. This creates buy sell opportunities. On the other hand, the markets are also fairly intellegence and over the course of time will tend to revert back to mean. Hence, REITScreener calculates the historical P/B Ratio on a daily basis and plots a chart. The price of the REIT is only considered under valued when it is below the historical P/B Ratio average. 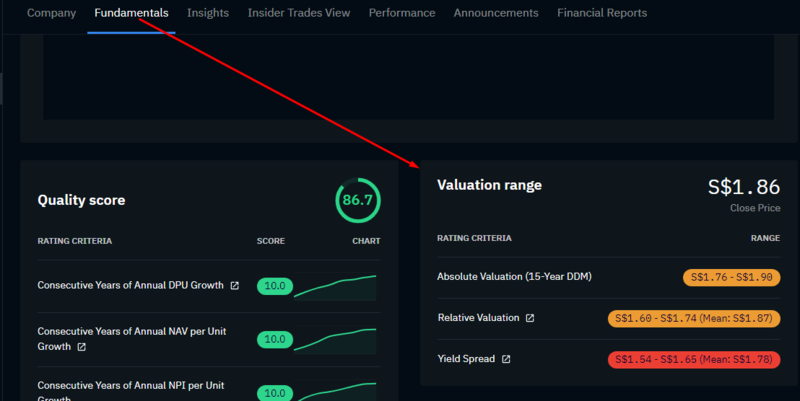 REITScreener considers the REIT a potential buy opportunity only if the price has fallen below at least 1 Standard Deviation (1StdDev) of the average and a strong buy opportunity when below 2 Standard Deviation (2StdDev) of the average. 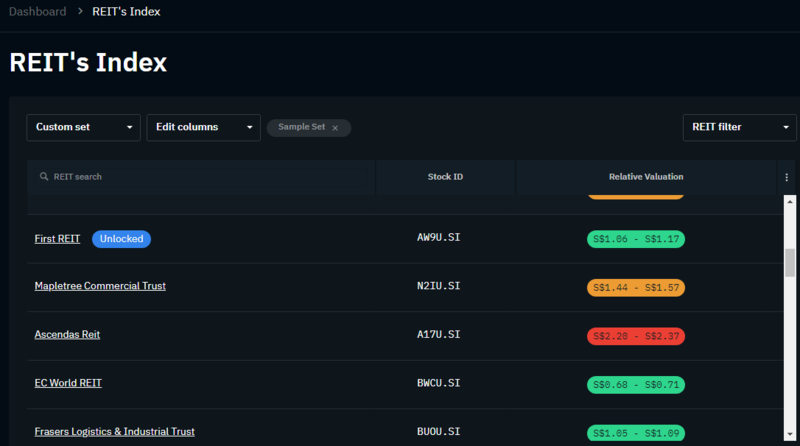 Likewise it would be a potential sell opportunity when trading above a 1StdDev from the average and a strong sell above 2StdDev from the average. Depending on a investor's time horizon, this chart can be viewed over a short term (1-Year), medium term (3-Year) or long term (5-Year) basis. 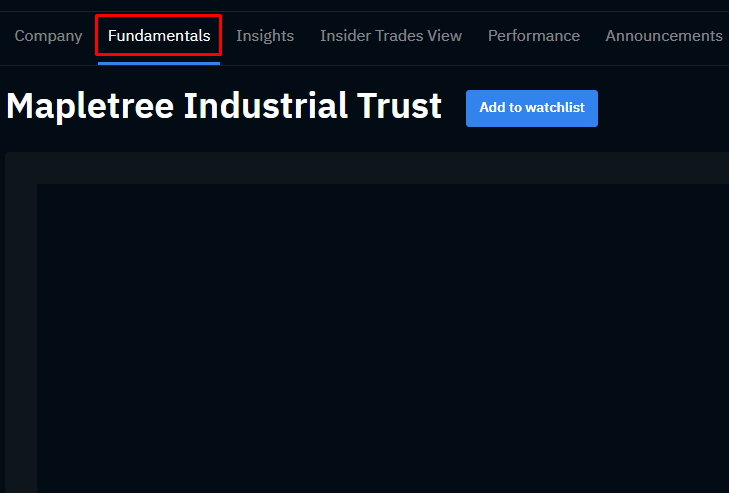 The range shown in the REIT Fundamentals page refers to the potential buy range between 1StdDev and 2StdDev. If the current price is trading within or below this range, the indicator will turn Green. If the current price is trading within the average to the 1StdDev range, the indicator will turn Amber. If current price is trading above the average, the indicator will turn Red. When the colour indicator is Amber, it means that the REIT had only traded at this price range over the historical period less than 34.1% of the time. When Green, it means that the REIT has only ever traded at this range less than 13.6% of the time and would be a rare opportunity. The similar to the P/B Ratio method, the third method is based on Yield Spread. The yield of the REIT is calculated on a daily basis and plotted into a charge. The Yield Spread is derived by taking the difference between the yield and the yield of the 10-year government bond of the respective country of listing. 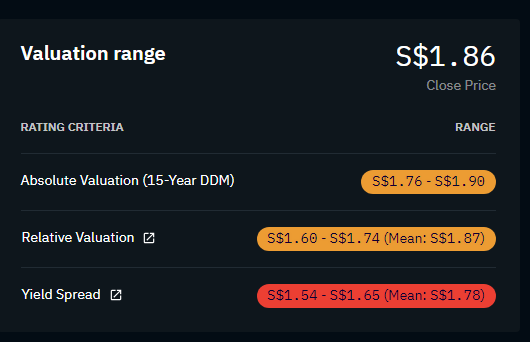 For example, a REIT such as Ascendas REIT which is listed in Singapore will be compared against the 10-year Singapore government bond yield. REITScreener uses the 10-year government bond as a proxy for interest rates. Therefore this method would be most relevant to investors who strongly believe in the correlation of REITs and interest rates. REITScreener plots the Yield Spread chart based on the 1StdDev and 2StdDev above and below the average. The interpretation of the colour indicators and range is similar to the P/B Ratio method. All three valuation method are unique in themselves and do not necessarily need to correspond or align with each other. As both P/B Ratio and Yield Spread method rely on the price to calculate the valuation ranges, it therefore is impacted by market sentiments. However the modified DDM method does not depend on price and purely based on historical DPU performance, it is not impacted by market sentiments. 4. Scroll down and you'll see the Valuation Ranges on the left side. Hence if the sentiment of a specific REIT is weak despite strong fundamentals, it is possible that the modified DDM range is higher than the P/B Ratio and Yield Spread ranges. This is because the market is reacting ahead of the fundamentals. On the other hand, when there is strong sentiment with regards to a REIT, the reverse may be observed. This can be explained by the market according a higher than normal valuation due to some intangible factors not immediately visible based on its past track record. Perhaps the REIT is backed back by a strong and reputable sponsor or perhaps the REIT has a strong branding or preceived to be strong and predictable. 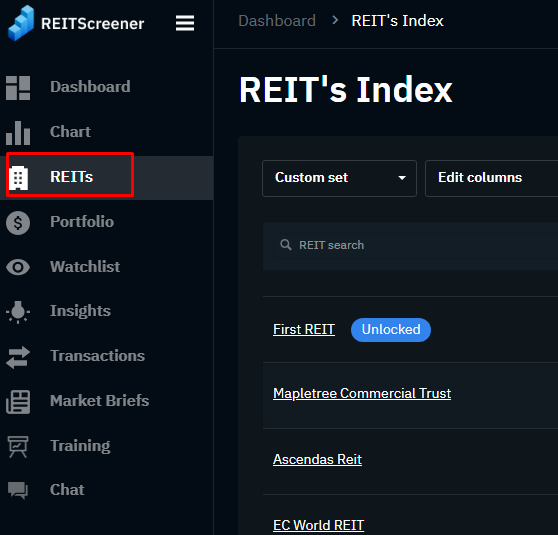 REITScreener hopes that by putting out all the various methods of valuations on the REITs, investors can make a more informed decision with regards to their investments without having to tediously churn through large volumes or historical data or financial reports. 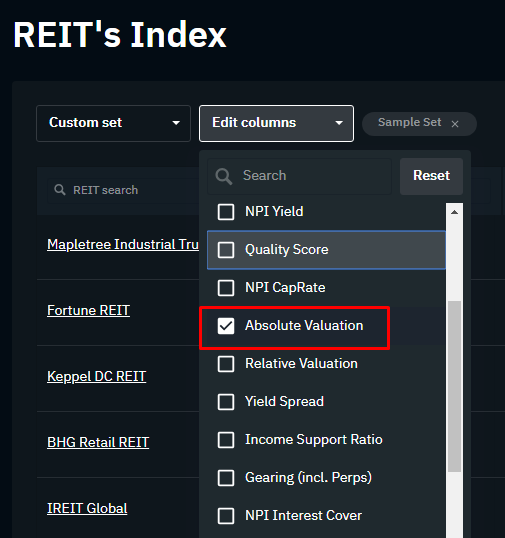 Please note that the Valuation Ranges is not a recommendation to buy or sell, instead it helps investors to identify REITs in thier potential buy or sell ranges only. 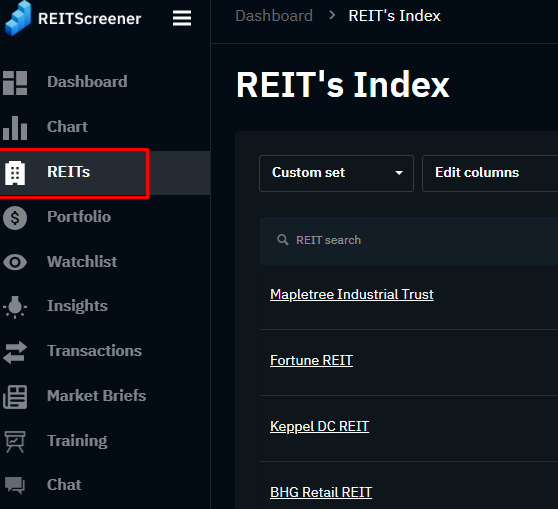 Just because a REIT is trading at is buy range does not mean that the price cannot fall lower likewise a REIT trading at its sell range does not mean that the price cannot rise higher. The final decision is always left to the due deligence of the investor.